Chicago's long and colorful history includes troublesome tales of flooded homes filled with five feet of contaminated, bacteria-carrying water from sewer backup. After the flood of 1997 caused hardship and property loss for some 35,000 residents of its close to three million population, city officials took action. To prevent the system from reaching maximum capacity they pursued slowing the heavy inflow of rainwater into the sewer system during the peak of the storm. 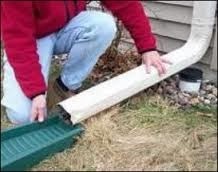 City officials installed mechanical devices called inlet restrictor valves and promoted downspout disconnection by homeowners citywide. Purchase and installation cost $75 million dollars. This was about a quarter of what traditional sewer system improvements would have cost. A $7.8 million grant from the Federal Emergency Management Agency Hazard Mitigation Grant Program (HMGP) jumpstarted the Chicago project in 1998. Chicago Sewer Department Commissioner, said, "In every subsequent rain that we've had since the pilot program was implemented, the pilot areas have not experienced the type of flooding they normally would have." Chicago initiated its inlet control valve system (called the "Rainblocker" program) as one facet of a multi-dimension concept. DWM workers installed close to 200,000 inlet restrictor valves into Chicago's street catch basins, at a rate of 90 to 120 per day. 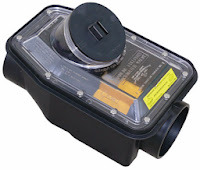 When the restrictor valve is installed in the storm water catch basin in the street, the device, in essence, shrinks the pipe to funnel and regulate the water from the street to the main sewer line. During a heavy rain event, the smaller opening allows less water into the sewer system. 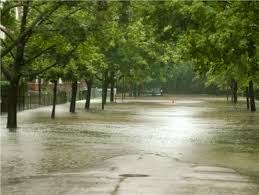 The streets act as a temporary holding area for the rainfall. Surplus water in the system will not be forcing contaminated water back through homeowners' private lines and into the home's lowest spot - the basement. The street ponding buys time for the system to catch up. re in previous storms their basements had held over a foot of water. In some instances, however, homes that had never been flooded before were flooded in this last event due to ponded runoff entering basement windows and doors. Homeowners still experiencing back-ups can consider a backflow prevention valve. Chicago area drain contractors are listed below. Are You Feeling (Un) Lucky? What Are The Odds? What Is Insured?